A baby crib with changing table attached is an awesome way to maximize the space in a nursery and has become of the best space-saving solutions. Most of us don’t realize the lack of space we have in our baby’s nursery until we get in there and start setting it up. By simply combining two necessary components that every nursery must have, you’re able to save a lot more space than you think. There are many manufacturers out there that offer a 2-in-1 approach making life much more convenient while leaving a tiny footprint. Some of the biggest names in the business-like Stork, Delta Children, Dream on Me, and many others you may not have heard of have all been considered leading us into our next review. The following details the Top 5 Baby Crib with Changing Table Attached in 2018 as we’ve broken down the best of the best while looking at value, quality, craftsmanship and so much more. Delta Children introduced this modern design crib which features a changing table attached scoring a 9.9 out of 10. This amazing option is perfect for nurseries that lack space or those looking to be much more efficient. Having everything within an arm’s reach including the crib, changing table and plenty of storage. The modern look makes it easy to match the rest of the décor and fits perfectly in both girls and boy’s nurseries. The Abby extends with your child converting to a toddler, day or full-sized bed down the road. The day bed is included, but the guard rail or bed rails for a full-sized bed are not. Other features include a mattress which can be adjusted to three different positions, two drawers and shelves, changing pad along with a safety strap and it exceeds all ASTM safety standards. Delta Children makes an appearance in this review with the Birkley which is a 4-in1 solution perfect for any sized nursery. This crib with changing table attached is a great option and won’t cost you a fortune to get it. The Birkely offers plenty of versatility making it a perfect option for boys and girls with three color options to choose from including gray, white and dark chocolate. 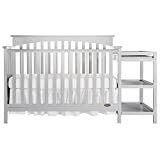 What separates the Delta Children Birkley convertible crib apart from the rest is the added flexibility for simple conversion from crib to a toddler or full-size bed. Delta Children allows you to extend this 4-in1 with other products giving you a solution to easily match the nursery with other necessary nursery products. Included is a 3-position mattress which can be easily adjusted, changing table with two drawers and one shelf, and meets ASTM safety standards. The best value in this review belongs to the Chloe from Dream on Me and comes in under $200. At this price you wouldn’t expect to get a 5-in-1 solution perfect for girls and boys with a simple, modern white finish. Aside from the crib and changing table you get plenty of storage including three large shelves and as your baby grows so does the Chloe easily converting to a toddler bed. The Chloe has an all-positive rating from consumers just like you and is one of the newest cribs with a changing table attached in this review. Notable features include a teething rail, full bed conversion kit, and meets all CSPC and ASTM safety standards. It’s also available in five finishes including gray, white, black, espresso and cherry for those looking to refine their look. When Stork Craft introduced the Portofino, which is available in an amazing Espresso finish it instantly became a hit with parents. This 4-in-1 combo has become an Amazon top-choice and boasts well-over 800 all-positive consumer reviews. At this price you couldn’t ask for more highlighted by everything you need including a convertible crib, changing table, 2 drawers and shelf. Meeting all safety standards set forth by CSPC and ASTM gives parents reassurance their loved one will be safe always. The high-quality look extends to the exceptional build quality featuring durable pine wood and all high-quality components. Notable features include easy conversion from crib to a full-sized bed or day bed with a metal frame that’s not included. Imagin introduced an amazing 4-in-1 solution that will save you a ton of space in the nursery. This crib and changing table combo includes the mattress pad and will be with you for years to come as it easily converts to a toddler bed as it grows with your child. The Montville Chocolate Mist is one of the most efficient ways to make the best use of space and is the ideal solution for smaller nurseries. The Mist comes in aggressively priced and when pricing each piece on their own you’ll spend so much more. You’ll also get ample storage with a drawer and shelf included and the overall build quality is second to none. As your child grows, its fully extendable to a toddler or even full-sized bed and exceeded all government and safety standards giving you added peace of mind. Be sure to drop us a comment if you have any further questions with this review of the top crib with changing table attached options in the section below.